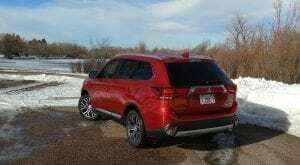 The 2018 Mitsubishi Outlander is largely unchanged from this generation of the crossover-SUV, which debuted several years ago. Though long in the tooth, the Outlander continues as a low-cost, family-friendly three-row option worth considering if budget-minded capability is your primary concern. For the 2018 model year, Mitsubishi didn’t change too much with the Outlander or its smaller Outlander Sport model. Most of the changes are in content shuffling through the trim packages, adding a new Limited Edition (LE) trim to the middle of the lineup. 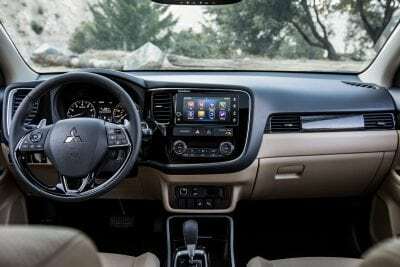 The base model 2018 Outlander now includes a 7-inch touchscreen for infotainment, nixing the previous model years’ lower-end infotainment baseline. 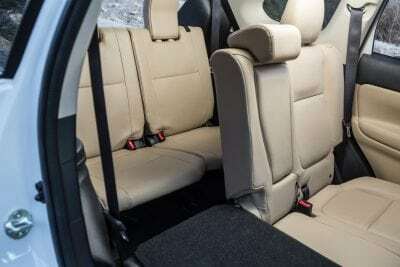 The feature-rich interior is part and parcel for the Mitsu lineup, though by today’s standards it’s relatively plain and unadorned. Harsh plastics and monotone colors still dominate in the lower trims of the Outlander, but the upper-middle and higher trims (especially the sporty GT) have inlay and other trim point additions that do a good job of adding a little bling. 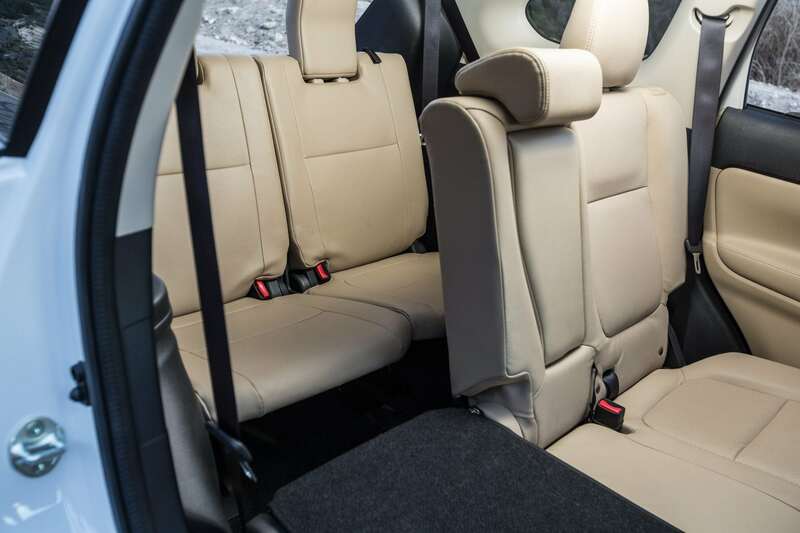 Most families need basic things in a crossover, such as plenty of roomy seating, cargo versatility, good fuel economy, and dependable safety. The 2018 Mitsubishi Outlander checks those boxes with seating for up to seven and an easier-to-load cargo space than most of its competitors. There are five trim levels for the 2018 Outlander, starting with the base ES model and moving through to the V6-powered, sporty GT option. All trims have front-wheel drive or optional or standard all-wheel drive. Each trim builds on the previous one. Outlander ES – The standard ES includes a four-cylinder engine and continuously variable transmission (CVT) turning 18-inch alloy wheels. LED running lights, heated mirrors, cruise control, dual-zone climate, leather-wrapped steering, split-fold second and third row seating, a rearview camera, Bluetooth connectivity, and a 7-inch touchscreen are included. SE – The SE model adds foglamps, keyless ignition and entry, heated front seats, and upgrades to the infotainment to include Apple CarPlay, Android Auto and satellite radio. LE – This trim adds black roof rails, black exterior trim points, and blind-spot monitoring with rear-cross traffic alert. SEL – This is probably the best value-added trim level in the lineup with automatic headlamps, power-folding mirrors, automatic wipers, a power liftgate, leather upholstery, auto-dimming rearview, and gloss-black interior trim. Optional equipment not available on lower trims is also available, to include highlights like a 360-degree parking camera, sunroof, and lots of driver aids and safety add-ons. MOst of the latter are in the Touring and Premium packages. GT – is like a fully-loaded SEL (minus the Touring package) but adds a powerful V6 engine and conventional automatic transmission. Chrome accents on the exterior, steering wheel shift paddles, standard all-wheel drive, and more. An optional GT Touring package adds the safety equipment from the SEL Touring upgrade. The 2018 Mitsubishi Outlander doesn’t do a lot to make itself stand out from the crowd, in terms of exterior looks, but it has a comfortable way about itself that fosters some endearment. Time has caught up with what was once a forward-looking design for the Outlander and most of its competitors have moved on. 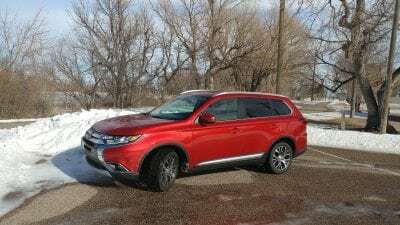 The 2018 Outlander isn’t ugly, though, and does carry itself well. The straight-edge body styling has a sort of timeless element to it and the squared-off rear hatch has a a practical appeal that promises usefulness in daily life. 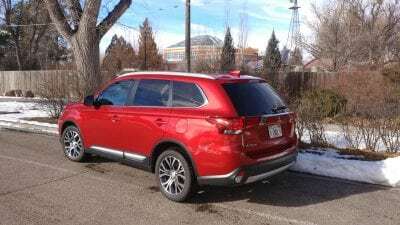 The 2018 Mitsubishi Outlander comes standard with a 2.4-liter four-cylinder engine and a CVT. This engine outputs 166 horsepower and is mated to front-wheel drive with an all-wheel drive (AWD) option, which Mitsubishi called All-Wheel Control (AWC). We highly recommend the roughly $2,000 upgrade cost to get AWC as it’s well worth it if the weather gets hokey where you live. The 2.4’s performance is decent, but not great. 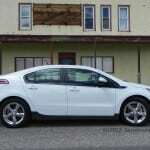 It does well in daily driving with plenty of power for getting around town and for freeway driving. It won’t hurry through the passing lane at over 75 mph and doesn’t do well when the vehicle is loaded with passengers or pushing against a crosswind, but it does get the job done most of the time. The engine gets noisy when being taxed, but never gives up. 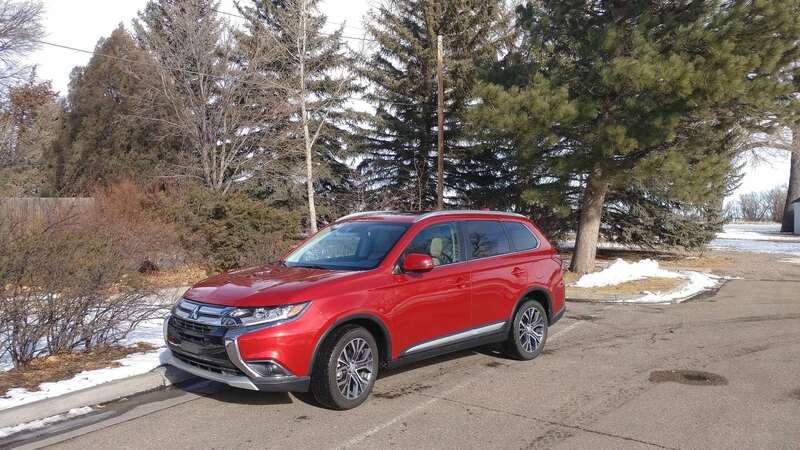 What tickled our pocketbook was the great fuel economy that the 2018 Outlander delivers with this drivetrain. Rated at 25 mpg in the city and 30 mpg on the highway in AWD and we saw that delivered handily during our week with the crossover. Our overall average was 26 mpg despite heavy weather, lots of “Snow Mode” use, and daily warmups in the driveway. 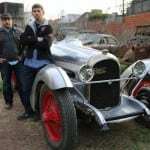 For reference, the top-most GT model has a 3.0-liter V6 and six-speed automatic transmission that output 224 horsepower. 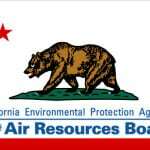 Fuel economy is EPA-rated at 20 mpg city and 27 mpg highway. Our greatest surprise was with Mitsu’s AWC system. We had some harsh weather while the Outlander was in our possession and it handled it beautifully. 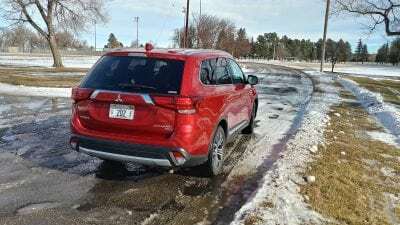 Despite the often deep, then frozen snow we traversed, there was nary a slip or slide out of the 2018 Outlander unless we wanted it to be there. This is a wonderfully astute all-weather machine with lots of confidence when the going gets slippery. Even on just standard all-weather tires like we had. There are far fewer three-row offerings in the midsize or smaller segment to choose from nowadays. Those that are available, however, are highly competitive. Honda CR-V – is a good option and is a segment best-seller for a reason. It’s not as large as the Outlander and is more expensive, but has everything one could want and more. Hyundai Tucson – also a top competitor, the Tucson is also sportier to drive and which brings a much more realistic value proposition to the table. We also note its comparable warranty to the Mitsubishi. Kia Sorento – another great competitor, the Sorento is squaring up to be a serious segment rival in both price and options. Budget-minded three-row that delivers all of the requirements of family buyers. High safety ratings that have been consistent through this generation of the Outlander. Dated exterior that is becoming unstylish. Lower-end interior ergonomics compared to several in the segment that have really set a high bar. Resale value fairly low for the segment, which hurts the value proposition despite the low cost of entry for the Outlander. There are a lot of options when cross-shopping the three-row, midsize crossovers category. Among them, though, should be the 2018 Mitsubishi Outlander as a comparison of what can be had for the lowest amount of money. When the budget crunch comes down, it’s likely that any of the Outlander’s trim points will compare well with the other options. 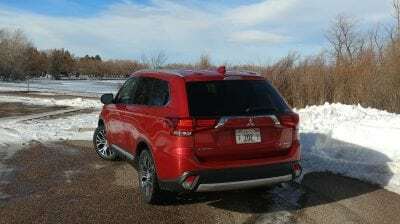 Where the 2018 Mitsubishi Outlander really makes it case, though, is in the value versus capability comparison. None of the competition can truly measure up in terms of all-wheel drive capability, cargo options, and price point. For that, the Outlander stands alone and will remain a good option. The 2018 Outlander was a manufacturer’s press loan for about a week. During that time, a total of 280 miles were put on the vehicle in varied weather and with several passenger loads. 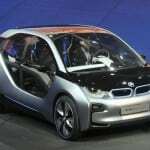 Distances included short and long trips with around-town and highway driving.